Wahgunyah set to sizzle the season. During the off season the club and its members have been very busy making further improvements to the facility located on the Murray River flats amongst the towering redgums, the committee and members of the Corowa Rutherglen Motorsports Club have been instrumental in bringing the venue up to the standards it is at today. The club have now extended the pits to accommodate the large car attendance they have been achieving over the last few years and with this year’s big events it was certainly a good move. After the completion of the new pit office and storage building it was decided that it was to good an opportunity not to utilize the position it was in, the club have now erected a VIP/Sponsors Deck overlooking turn 4, this is a fantastic place to entertain sponsors with the best view in the house. The big drawcard for the upcoming season would have to be the Victorian Title for Late Models on Australia Day January 26th, with the Australian Title only 2 weeks later at Valvoline Sydney Speedway there is a high chance of a big list of Australia’s best that will be looking to use the Victorian Title as a prelude to the Aussie, with up to 30 Late Models expected it will be one event not to miss. The Mighty V8 Dirt Modifieds make a return to the wide-open spaces of Wahgunyah Speedway on May 11th, Super Sedans return again on May 25th, AMCA Nationals have to visits to the 610-metre circuit and the season will finish with a bang on June 9th with the Victorian Title for the pocket rocket Legend Cars and we welcome the SDAV Hotrods to Wahgunyah for the first time. 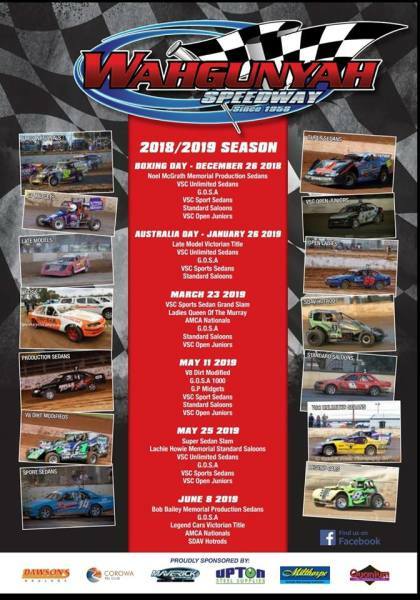 To complement all these exciting divisions, Corowa Rutherglen Motorsports Club are very excited to have the VSC Unlimited division as part of their upcoming season, these drivers know how to put on some great racing and Wahgunyah will certainly be no different. All the special events honouring past members will again be run and will always hold special significance for many current members, “Noel McGrath Memorial” (Production Sedans), “Lachie Howie Memorial” (Standard Saloons) and the “Bob Bailey Memorial” (Production Sedans). Locals Divisions will be there at every event to support the visiting classes and will all have a special feature event during the season, Standard Saloons, VSC Sports Sedans, VSC Open Ladies, VSC Open Juniors and GOSA (Goulburn Ovens Sedan Association) will all be fighting it out to take the club championships. So, make sure you get to Wahgunyah Speedway this season for a great night’s entertainment. For more information please visit the Wahgunyah Speedway Facebook page. BB Motorsport Management & Promotions. To say that the 2017 National Production Sedan Title at Wahgunyah Speedway last Friday and Saturday night was a sensational event would be quite the understatement, and it was highlighted by a popular 1-2 finish for the locally-based father and son duo of Trevor and Jacob Mills. 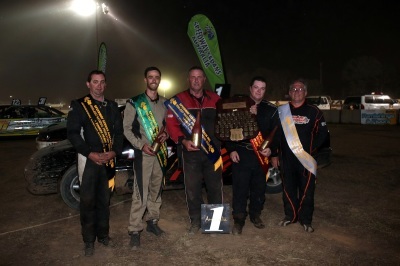 The 2017 National Production Sedan Title, which was supported by Corowa Food 4 U / Ricky D’s Pizza - Corowa / Winton Motor Raceway and Maverick Marine - Corowa, resulted in the Mills duo, from nearby Corowa, dominating in front of their home crowd. 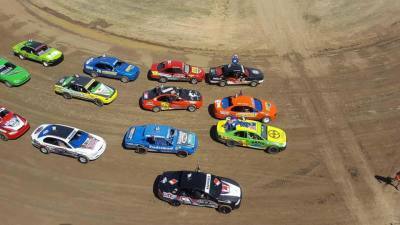 It was a fitting end to what was a fantastic two nights of racing from the Production Sedan class that attracted drivers from around the country. 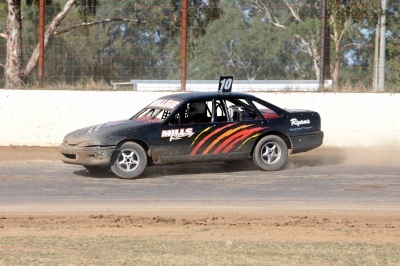 All of the action was witnessed by large crowds throughout Wahgunyah Speedway’s maiden attempt to host a National Title. After qualifying towards the front of the field for the National Title deciding feature race, Trevor Mills, who had started from position four, used every ounce of his experience to get to the front in the early laps. Once out in front, he was able to rely on his experience to set the pace around the 610-metre track and went on to score an unchallenged win. For Mills, this was his first National Title success in his 30-year speedway career. Making it an emotion-charged 1-2 finish was Trevor’s son and 2011 National Title holder Jacob Mills in second. Like his dad, Jacob, who had started in position five, quickly moved into second and that was where he stayed all the way through to the fall of the chequered flag. Mills certainly had to fight hard throughout the 40-lap distance to hold on to second and complete the historic 1-2 family finish. Behind the Mills duo in third place on the podium was Kane McDiarmid. The Western Australian-based racer, who finished second in last season’s National Title, had started from position three, but he showed great pace during the race and certainly kept Jacob Mills honest, as they battled over second for the majority of the race. Heading into the feature race, Victorian Stephen Laidlaw was the form driver and therefore started from pole position. In the early stages of the feature race, the veteran made a rare mistake and spun out in turns three and four. As a result, the two-time National Champion (2002 and 2003) was sent to the rear of the field. Another form driver was 2010 National Champion Rod Musarra (WA), who was also sent to the rear early on after contact with Jacob Mills while they were battling for a podium spot. Both Musarra and Laidlaw put in solid comeback drives to finish in fourth and fifth place respectively. The top-10 finishes were Chris Pagel (Qld), Paul Barklem (NSW), Brett Norman (NSW), Adam Wilson (SA) and Wayne Bourke (NSW). Damien McAlister (NSW), Brendan Harper (Vic), Raymond Ussher (Vic) and Matt Hutchinson (NSW) rounded out the remaining finishers. Defending National Champion Tim Green (WA) had an unhappy weekend and it saw him crash out in turn four on just the third lap of the feature race. Other feature-race retirements were second highest point score and National Title surprise packet Steven Downes (NSW), Stuart Fawcett (NSW), Daniel Henshaw (Qld), ACT Champion Wes Barnes (NSW), Lindsay Manning (NSW) and Matt Vicary (NSW). One of the hard-luck stories of the weekend was Mark Jennings (SA). Driving for the Albury-based Patriot Motorsport team, Jennings had qualified an impressive ninth aboard his duel-registered FG Ford Falcon for the National Title deciding feature race, but he was unable to make the start, due to an overheating engine issue. Earlier in the night, the B main was claimed by Damien McAlister ahead of Matt Hutchinson, Manning and Harper, while the C main saw a popular win go the way of Selina Jennings (Qld) who defeated Steven Aldridge (Vic), Mal Pahl (Qld) and Gemma Laidlaw (Vic). In the support classes, the wins were shared between youngster Cameron Pearson (Late Models), current Australia # 2 Trevor Perry (GP Midgets) and Courtney Meakins (Junior Sedans). Pearson, who is the current Victoria # 2, claimed the True Blue 1000 ahead of teammate Daniel Barton and Canberra’s Scott McPherson. In the GP Midgets for the Thunder at the Murray event, Perry scored the overall points win, and he downed Jason Crawford and Lisa Chalcraft in second and third place respectively. Despite the Junior Sedan feature race not getting run, the overall points over the two nights saw Meakins take the win. Behind Meakins were Caleb Lincoln in second and Jamie Pumpa in third. The Wahgunyah Speedway committee would like to thank everyone (volunteers, drivers, crews, officials and spectators) for their wonderful support throughout the National Title and helping make it a sensational and memorable event. 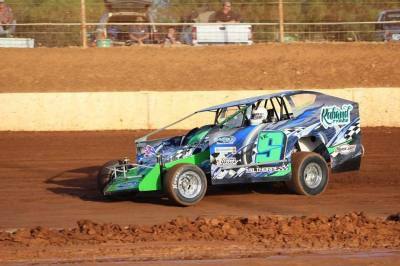 To find out more about Wahgunyah Speedway, visit their website at www.wahgunyahspeedway.com, contact David Walton on 0419 488 518 or follow them on Facebook by searching Wahgunyah Speedway. Wahgunyah Speedway is pleased to announce that Ricky D’s Pizza and its associate business Corowa Food 4 You have come on board as major sponsors for the 2017 National Production Sedan Title, which will be held at the track on January 26, 27 and 28. Corowa-based business Ricky D’s Pizza, which also contains a juice bar and offers DVD hire, is a popular pizza restaurant which offers pick up, delivery or dine-in options to satisfied patrons. Ricky D’s also recently introduced their mobile catering cart, which offers egg and bacon rolls, hot dogs and more, with a pop up café also available. Joining Ricky D’s Pizza as the major sponsor of the National Title event is mobile catering service Corowa Food 4 You, which is the affiliate business of Ricky D’s Pizza. Wahgunyah Speedway and the Corowa Rutherglen Motorsports Club would like to acknowledge the support of our Silver Sponsor for the 2016/17 Australian Production ...Sedan Title, “Winton Motor Raceway, “The Nations Action Track”. In recent years Winton Raceway has come along in leaps and bounds, with a very small team of dedicated people led by Wayne Williams as Operations Manager and Brett Balins as Events and Track Coordinator they have introduced lots of new and exciting things, and 2017 is shaping up to be a massive year that includes the following: V8 Supercars, Australian Superbike Championships, the Inaugural “Rockin The Raceway” Rock concert and of course the much talked about Speedway day which is to be turned into a 2 day festival of Speedway on July 15th and 16th 2017. The Speedway Festival this year will incorporate a Speedway Swap Meet, Passenger rides, Legend Car drives and of course everyone fighting for the honour of “Quick Time”, all this in a fun filled action packed weekend. Winton Raceway also offers other great facilities including a 1000 seat function centre, Catering for small and large groups, Circuit hire, the campground and many different forms of motorsport throughout the year. 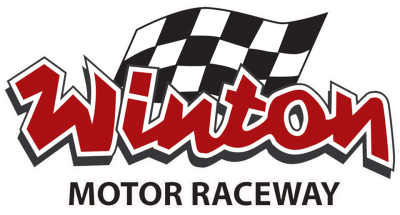 If you would like to discuss what Winton Raceway can do for you give the office a call on 03 5760 7100. So make sure you get on down to Winton Raceway and check out the action, you won’t be disappointed. The 2016/17 Australian Production Sedan Title and Wahgunyah Speedway would now like to acknowledge the support of our Bronze sponsor for this major event, Maverick Marine is a local Corowa owned and operated business that provides all services boat related, the team at Maverick Marine provide the highest level of professional and friendly service with an extensive range of new and quality pre-owned vessels. Whether you are buying or selling, Maverick Marine's experienced sales team will ensure that you receive the advice and assistance required to make the right decision. They can do anything with nothing. Maverick Marine on 02 6033 3222.